[S40] UK National Census for 1851 for UK, "HO 107 2188 ED1 f51 p18 68." [S1] Website IGI (www.familysearch.org) "M005993 St Nicholas (Liverpool) 1829-1846." [S76] UK National Census for 1841 for UK, "HO 107/568/18 f56 p18." [S82] UK National Census for 1851 Index, Liverpool "H.O. 107 2188/1 f51." [S47] UK National Census for 1861 for UK, "RG9/2932 f96 p41 248." [S82] UK National Census for 1851 Index, Liverpool "2188/1 f51." [S1] Website IGI (www.familysearch.org) "P020274 St Peter (Liverpol) 1833-1839." [S49] UK National Census for 1881 Index, UK "RG11 Piece 3642 Folio 15 Page 28." [S601] UK National Census for 1881 for UK, "RG11/3642 f15 p28 149." [S45] Website FreeBMD (http://freebmd.rootsweb.com/) "Births Mar 1861 LACKLAND William Wirrall 8a 481." [S37] Website Cheshire BMD (http://cheshirebmd.org.uk/) "LACKLAND William 1861 Birkenhead Wirral Cheshire BIR/47/82. " [S72] UK National Census for 1891 for UK, "RG12/2932 f76 p29 174." [S704] UK National Census for 1901 for UK, "RG number: RG13 Piece: 3463 Folio: 9 Page: 9." [S45] Website FreeBMD (http://freebmd.rootsweb.com/) "Births Jun 1871Loughlin Martha Frances West Derby 8b 247." [S1051] Website Lancashire BMD (http://lancashirebmd.org.uk/) "2068TP/20/105." [S45] Website FreeBMD (http://freebmd.rootsweb.com/) "Marriages Dec 1896 RYLATT John Toxteth Park 8b 419." [S45] Website FreeBMD (http://freebmd.rootsweb.com/) "Marriages Dec 1896 Loughlin Martha Frances Toxteth Park 8b 419." [S45] Website FreeBMD (http://freebmd.rootsweb.com/) "Births Sep 1900 Rylatt Helena W. Derby 8b 342." 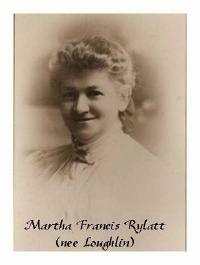 [S45] Website FreeBMD (http://freebmd.rootsweb.com/) "Births Mar 1903 Rylatt Annie Elizabeth W. Derby 8b 345." [S45] Website FreeBMD (http://freebmd.rootsweb.com/) "Births Sep 1873 Loughlin Frederick West Derby 8b 264. [S277] Baptisms, BVRI, FHL Film 1546001. [S49] UK National Census for 1881 Index, UK "RG11/3226 f10 p12." [S1051] Website Lancashire BMD (http://lancashirebmd.org.uk/) "REG_TP/64/36." [S45] Website FreeBMD (http://freebmd.rootsweb.com/) "Births Sep 1901 Rylatt Robert John W.Derby 8b 342." Spouse Father's Name: James Maddock." [S45] Website FreeBMD (http://freebmd.rootsweb.com/) "Births Jun 1904 Rylatt George W. Derby 8b 359." [S45] Website FreeBMD (http://freebmd.rootsweb.com/) "Births Mar 1906 Rylatt William Frederick W. Derby 8b 371." [S45] Website FreeBMD (http://freebmd.rootsweb.com/) "Births Sep 1912 RYLATT Edna M Loughlin W.Derby 8b 651." [S45] Website FreeBMD (http://freebmd.rootsweb.com/) "Births Sep 1914 Rylatt Doris Loughlin W.Derby 8b 642." [S1051] Website Lancashire BMD (http://lancashirebmd.org.uk/) "REG_WD/503/68." [S45] Website FreeBMD (http://freebmd.rootsweb.com/) "Births Dec 1897 Rylatt Florence W. Derby 8b 416." [S45] Website FreeBMD (http://freebmd.rootsweb.com/) "Births Jun 1899 Rylatt Elsie Frances W. Derby 8b 441." [S1051] Website Lancashire BMD (http://lancashirebmd.org.uk/) "REG_WD/408/95." [S45] Website FreeBMD (http://freebmd.rootsweb.com/) "Births Jun 1911 Rylatt Edith L W.Derby 8b 362." [S45] Website FreeBMD (http://freebmd.rootsweb.com/) "Deaths Mar 1917 Rylatt Edith L 5 W.Derby 8b 589." [S752] Website Genes Re-United (http://www.genesreunited.com). [S48] Online index to the UK National Census for 1901 for UK "RG13/3432 f7." [S189] Clayton Family Bible "unknown cd." [S70] General Record Office Indexes "June 1915 West Derby 8b 651 MATCHETT Douglas R (POTTS)." GRO Reference: 1867 D Quarter in WEST DERBY AND TOXTETH PARK Volume 08B Page 310." [S49] UK National Census for 1881 Index, UK "RG11/3636 f48 p38." [S48] Online index to the UK National Census for 1901 for UK "RG13_Pc-3427_Fo-99_Pg-18 143." [S2] UK National Census for 1871 for UK, "RG10/3795 f33 p1 5." [S2314] Website Toxteth Park Burials (http://www.toxtethparkcemetery.co.uk/dbase/toxsearch.htm) "MATCHETT Margaret 33 years - 143 Beaufort Street 3 November 1901 4431 88331 C 13 258 352 CEM 9/1/18." [S45] Website FreeBMD (http://freebmd.rootsweb.com/) "Deaths Dec 1901 Matchett Margaret 33 Toxteth Park 8b 136." [S49] UK National Census for 1881 Index, UK "RG11/2181 f9 p12." [S2284] Sheila Pepperell, Tree, 2009 "unknown cd." [S70] General Record Office Indexes "Sep 1903 Toxteth Park 8b 231." [S945] E-mails from Mark Matchett to Alan Bennett, 2007 onwards "unknown cd." [S1051] Website Lancashire BMD (http://lancashirebmd.org.uk/) "Liverpool : REG_WD/462/112." [S70] General Record Office Indexes "Birth Dec 1898 POTTS Sarah Elizabeth Weardale 10a 284." [S70] General Record Office Indexes "Births Sep 1897 Potts Sarah Elizabeth Gateshead 10a 972." [S70] General Record Office Indexes "Death March 1965 MATCHETT Sarah E 67 Liverpool S. 10d 547." [S70] General Record Office Indexes "March 1910 Toxteth Park 8b 179." [S1051] Website Lancashire BMD (http://lancashirebmd.org.uk/) "Liverpool : 2059WD/5/395." [S70] General Record Office Indexes "Birth JUN 1913 TODD William H BRANCKER Prescot 8b 1459." [S70] General Record Office Indexes "June 1908 Toxteth Park 8b 192." [S70] General Record Office Indexes "June 1911 Toxteth Park 8b 178." [S45] Website FreeBMD (http://freebmd.rootsweb.com/) "Births Sep 1905 Matchett Lilian Toxteth Park 8b 173." [S1051] Website Lancashire BMD (http://lancashirebmd.org.uk/) "2111LP/8/165." [S772] Webpage Obituary for Olive Matchett (http://icliverpool.icnetwork.co.uk/familynotices/page.cfm) "MATCHETT - OLIVE SYLVIA, December 23, 2005. Passed away peacefully in Redholme Memory Care Nursing Home. Beloved aunt of Ian, Harold, Brian, Raymond, Brenda, Audrey, Joan and Walter. Service and cremation at Springwood Crematorium on Tuesday January 3, 2006 at 12.30pm. All enquiries to Pearson Collinson FS, 91 Allerton Road L18 2DD Tel 0151 722 1514. The Family wish to thank the Methodist Home for the Aged and Redholme Memory Care for all of their care and thoughtfulness in Olive's final years. First appeared on 30 Dec 2005."